People often ask whether we have internet or email aboard and how we go about communicating with the outside world, posting these blog articles and receiving weather information. The short answer is no we do not have access to the internet; but we can send and receive email and access some information that is published on-line. By sending text and very small pictures via email I can update the blog even at sea; large high resolution photos have to wait for some time in an internet cafe.On “Morgane” we use the Sailmail service for our email, this is not-for-profit association of yacht owners which maintains an email system for the use of its members. There is an annual subscription that usually costs around $250 USD; which is the only cost of using the system other than the initial capital outlay on some hardware. The service can be accessed via HF (high frequency) radio and a Pactor modem or via several of the various satellite systems. We generally use the HF radio (a Yaesu FT-857). Sailmail provide a purpose designed software application called “Airmail” which in addition to the usual email features found on any email programme also handles the special transmission and reception protocols required. Sailmail also provides and maintains a network of HF coast stations that provide global coverage. Transmission and reception via the HF radio and the narrow bandwidth satellite services such as Iridium, INMARSAT’s iSatPhone, and Globalstar is slow and therefore the system strips out attachments (except those of a certain type used for transmitting weather forecast information) and compresses the emails. The maximum size allowed is typically 30 kBytes. HF radio is also subject to the vagaries of propagation conditions which are affected by the: geographic location of the stations, the Sun cycle, season, interference and host of magical things that happen in the ionosphere; all this means that conditions are only suitable for access to a particular coast station at certain times of the day. We usually access the system once or maybe twice a day. This requires some planning as to when to make the connection. Some factors affecting when to connect are: propagation, daily routine aboard, the published GRIB (weather forecast files) times, and sometimes our physical location. As an example; sometimes in the Chilean Channels the anchorages are so protected that it is impossible to get a radio signal, or even a satellite signal, out so this requires that you make your daily connection while in the main channels before anchoring for the night. Typically there are two separate connections in a session. In the first we send out a request for a weather forecast and any other emails and any emails waiting for us on the system will also be downloaded. The second connection usually 20 to 30 minutes later collects the previously requested weather file and gives us time to send out any urgent replies to the messages in the first download. Online time is limited by Sailmail to 90 minutes per week so therefore we must carefully monitor connections and if propagation is bad or interference is causing a slow throughput then we disconnect and try again later when conditions improve. I hope that helps to explain how we keep in touch and why we can’t see anything except the text contents of your emails to the boat. 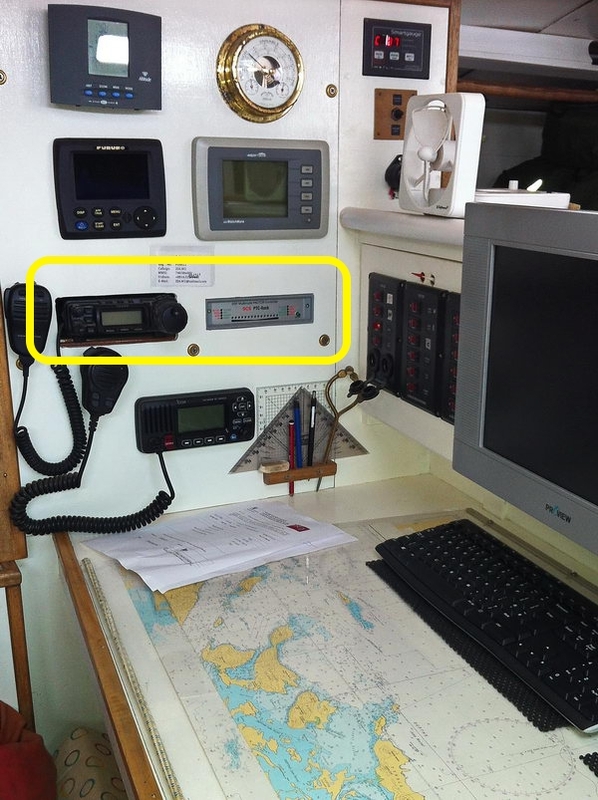 1 Pings/Trackbacks for "HF Radio, Sailmail, Airmail, Pactor and all that gubbins"